So I am working an off schedule this week so my days and nights are confused for the time being. While I burn the midnight oil, I have been checking out some new blogs and making new friends from Knitting and Crochet Blog Week 2012. I had so much fun but was definitely, blogged out for the time being. Anyway, it's WIP Wednesday so here is my weekly round up! The following projects are what has been worked on recently. 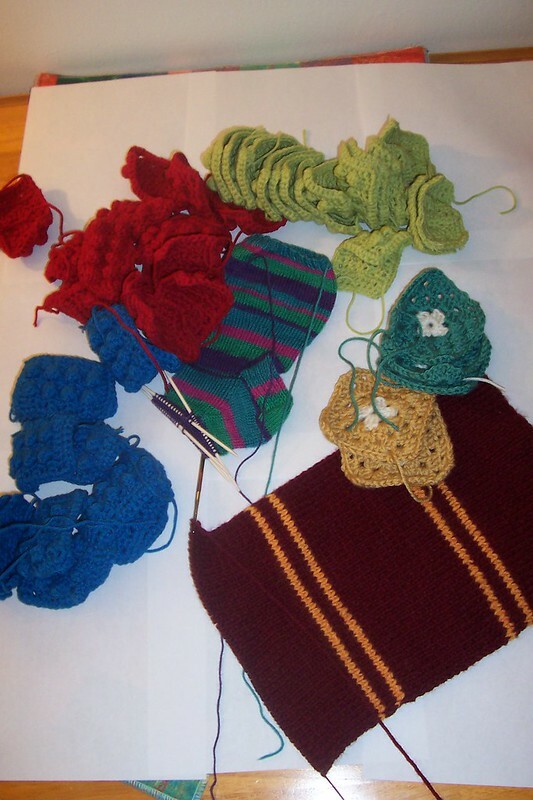 Starting with Gryffindor Scarf, LEGO Blanket, White Centered Granny Square Blanket, and Hummingbird Sock. I also made some progress on putting together the pieces for a Square Swap I did last spring. 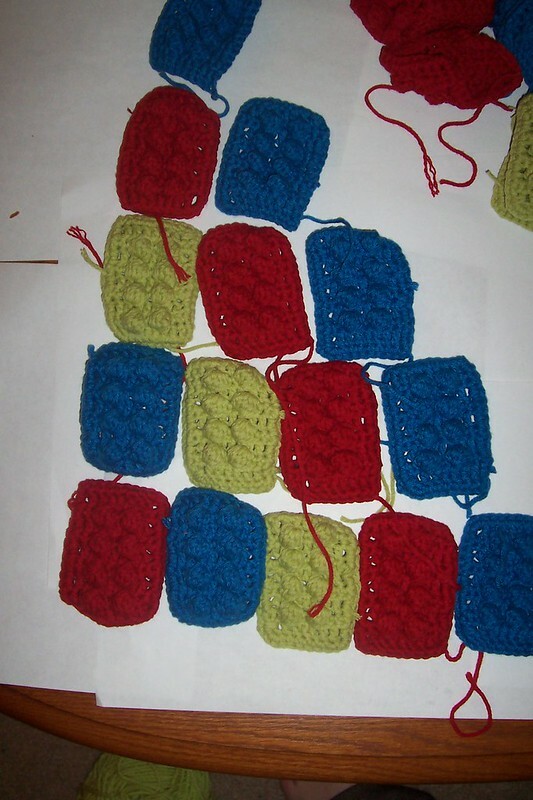 Anyway, finished off the skein of green for the Lego Blanket and now have a whole slew of little Lego squares. So close but so much more work to do! I turned the heel on my Hummingbird Socks! Now the foot and the decreases. I plan on starting a toe up sock in a plain pattern then I will start to tackle more challenging socks. The White Centered Grannies are coming along. They really area project that I do when I want to craft but have no desire to work on anything else. Lastly, I have planned a bit of a secret project. It really is Super! I mean I don't know if I can do it Justice, but I will try. I hope to make some progress soon but I was nerdy and already did my swatch! Oh I am so excited to get it finished because the finished product is going to be amazing, the process is a little tedious. You have so many great projects going right now! I love how the lego blanket is looking, that must be such a fun project! It is fun because I can't wait to see the parent's faces when it's done. ooooh that lego blanket is fabulous, I can't wait to see if all finished!!! Oh I can't wait either. I think its really going to look nice. Thanks! So many gorgeus projects! Lovely blankets! You have quite the assortment of WIPs! I'm making guesses at this secret, SUPER project. :-D I'll be eager to see if I was on the right track! I hope so. I am super excited about it, just need to get some stuff done to get started on it. Yay for Legos! I think the white centred grannies are really cute- I can see why they're demanding your attention! ARen't they plus I'm using cashmerino which is super soft! Love! 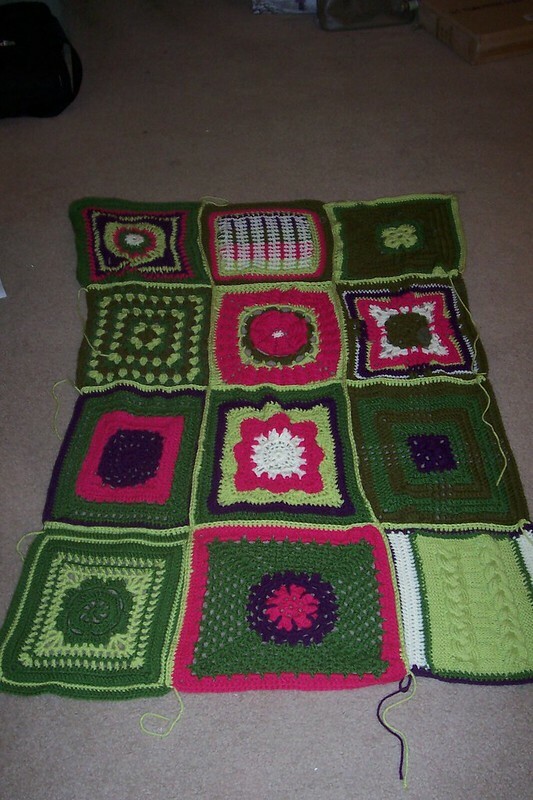 Your "Spring Ahead" blanket is going to be gorgeus! I can't take too much credit those came from 11 lovely ladies across the country including Canada. I think that would be brilliant! I want to do that too before I put it together. One more color left to go.